The mission of Certified Financial Planner Board of Standards, Inc. (CFP Board) is to benefit the public by granting the CFP® certification and upholding it as the recognized standard of excellence for personal financial planning. The Board of Directors, in furthering CFP Board's mission, acts on behalf of the public, CFP® certificants and other stakeholders. Why A CFP® Professional ? Compliance with these four areas informs you that an individual who holds the CFP certification mark is well prepared and qualified to give sound, professional advice. 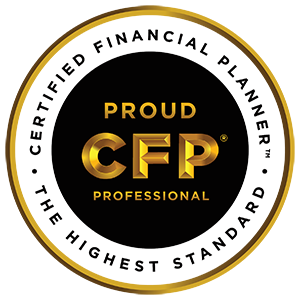 CFP®CERTIFIED FINANCIAL PLANNER™ and federally registered CFP(with flame logo) are certification marks owned by the Board of Certified Financial Planner Board of Standards. These marks are awarded to individuals who successfully complete CFP Board's intitial and ongoing certification requirements. This information was obtained from the FPA, Financial Planning Association's website.